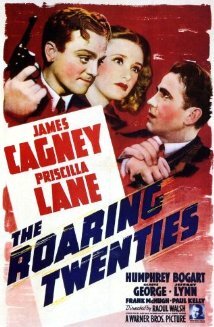 James Cagney first got my attention with "The Roaring Twenties" in my pre teen years (on television). This movie portrayed a transition from World War I where returning soldiers often found it difficult to get a job over to Prohibition that led to gangsters filling a need. It was an education that opened my eyes a little bit to historical forces, but what I really remember is what a tough guy Cagney was despite all that was against him. Humphrey Bogart and George Raft played other tough guys and Pricilla Lane the female lead. Directed by Raoul Walsh. I saw many of his tough guy movies. Perhaps as relatively short I projected myself. In many of his movies he always seemed ready to pick a fight, even if he didn't always win. Born in 1899. James came from a poor background and commented that his father had indulged in alcoholic rants. He worked at several jobs and stumbled into show business as just another job. One of his brothers, Harry, was in a theatre production and fell ill just before a show. James had not rehearsed, but had made himself very familiar with the role and was able to take over and make an impression. He had picked up tap dancing and became known primarily as a dancer who could learn new steps easily. He also did odd jobs for theatre productions and met his wife Frances Verner in this capacity. Unlike other Hollywood celebrities he remained loyal to her until his death. One of his breaks occurred when he replaced Archie Leach, better known as Cary Grant who had left a show to make a career move of his own. James got involved in choreographing a Broadway show and through this got to meet more directors. Paired in theatre with Joan Blondell they both got the attention of Al Jolson who bought the rights to the play they were in and then sold to another, but insisting the two be part of the deal. They paired off in a couple of movies to their mutual benefit. In many of his movies he does what might be called a rant. I believe there is a theatrical tradition at play where on stage it is necessary to exaggerate words and actions. In movies it often doesn't go over as well, but in Cagney's case it works. In fact it is what draws attention to him, but he also projects realism fairly well in most of his acting. In 1931 in "The Public Enemy" they wanted to show toughness and James pushed a grapefruit into the face of his girlfriend, played by Mae Clarke Both Jean Harlow and Joan Blondell had roles. Gangster movies were very popular and this set James up as a key model. Directed by William Wellman. In 1993 "The Mayor of Hell" was released where he played a gangster trying to reform a reformatory for young boys, while still retaining ties to his old gang. It all turns out ok in the end. The famous line "you dirty rat" is used in a scene with a woman insulting another man. Cagney has been tagged with this line and although he has expressed similar sentiments he never actually said this particular line. In 1935 he sued Warner Brothers for breach of contract and formed Cagney Productions with his brother William who had acted as his agent. William produced many of James' movies. Also in that year Cagney appeared in a Shakespeare comedy "Midnight Summer's Dream." In 1938 "Angels with Dirty Faces" was released also starring Pat O'Brien. I had referred to this in an earlier post to illustrate how a small thing (O'Brien outran Cagney when both fleeing police) can make a huge difference in life outcomes. The ending is a bit ambiguous (also very sobering) and Cagney wanted it that way. He received his first Oscar nomination. Directed by Michael Curtiz. In 1939 "Each Dawn I Die" was a rough, brutal prison movie, co-starring George Raft. Difficult moral choices. In 1940 "City for Conquest" he played a successful boxer who at the end was poor. A range of emotions. Ann Sheridan was the leading female. "The Strawberry Blonde" of 1941 is my favourite Cagney film possibly because I also liked Olivia de Havilland. The comic timing of the whole cast was impressive. Rita Hayworth was the strawberry blonde, but I was more pleased with Cagney's choice. In 1942 he was elected president of the Screen Actors Guild, that he had helped found. He seemed to feel actors needed to organize to get better working conditions. 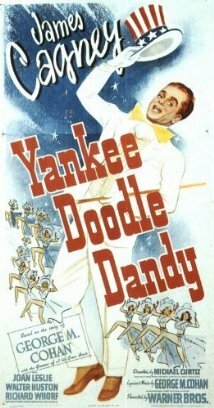 Also in 1942, an expressly American patriotic film, "Yankee Doodle Dandy" was released. It was a few more years before I watched it on tv and I was stunned that my favourite tough guy was a tap dancer. This role earned Cagney his only Oscar as leading male actor. While the war was till going full blast in 1945 "Blood on the Sun" was released with a strong anti- Japanese bias. Cagney learned judo for this role. In "White Heat" from 1949 he played his first gangster movie where the killer was not the victim of a poor childhood. Cagney was grimly realistic. Directed by Raoul Walsh. In 1955 for " Love Me or Leave Me" Cagney received his final Oscar nomination with Doris Day. Unfortunately I have not seen this film. "Man of a Thousand Faces" was released in 1957. I was familiar with Lon Chaney Jr as the Wolfman and originally enjoyed this movie as a success story. More recently was struck with the attitude towards working women. Cagney played a man with a double standard that probably was normal for the time depicted. 'Shake Hands with the Devil" came out in 1959 and Cagney portrayed a very grim role in Ireland. The film pointed out that violence begets violence. In 1961 "One Two Three" released as a comedy set in West Berlin during cold war . As a Coca Cola executive James was a fast talking manipulator. Although a comedy this movie proved to be not much fun for James and he quit acting at this point. Directed by Billy Wilder. He decided to retire to a farm on Martha's Vinyard and later in New York State He had turned down roles in My Fair Lady and The Godfather II After several attempts to lure him to do other films he agreed to do a supporting role in "Ragtime" A doctor had told him it might be therapeutic after he had suffered a stroke. Directed by Milos Forman. His last film was for tv. "Terrible Joe Moran" in 1984 which I missed. Because he was raised in an urban environment I was surprised to learn he was very interested in riding and raised Morgans. We forget that when he was born horses were the dominant mode of transport and even in a city would could encounter horses. In 1999 Cagney was ranked 8th of the 50 Americans Screen Legends by the American Film Institute. Died in 1986. He remains in my head and gives me pleasure. With 69 movie and tv credits there is lots more to see.